Congrats to our February Knight of the Month: Brother Thomas Fagbamiye. Thomas serves as an usher, Lector and Extraordinary Minister for many years. 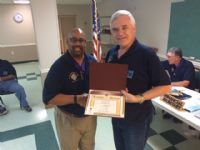 He is also our current Membership Director and, as a Past Grand Knight, also serves as a Trustee. He is also the Knight of Columbus' State Wheelchair Chairman. 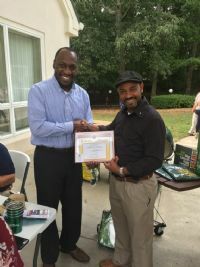 He regularly works with the Archdiocese of Atlanta's Office of Intercultural and Ethnic Diversity, as well as an organizer with the Pan African Catholic Organization of Atlanta. Thomas unselfishly gives of his time and talent and we are fortunate to have him serve in our council. Congrats Bro Thomas. Congratulations to our January Knight of the Month, Brother Charles Justice. 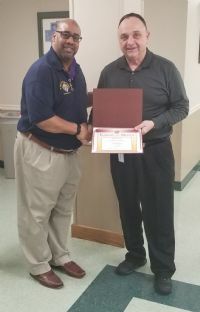 Brother Charles just joined our council in the last few months, but has already jumped in and assisted with our recent smoked turkey and ham sale (which benefited our annual Diaconate Luncheon), as well as our Annual Monastery Goods Sale. He is also an active contributor in our business meetings. Thank you Brother Charles and congratulations. 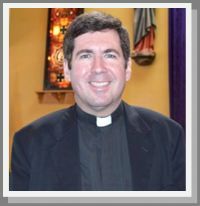 Our December Knight of the month is our beloved pastor, Fr. Joseph Shaute. Fr. Joe is a 100 supporter of the Knights of Columbus. He took his 2, 3 & 4th degrees at St. Theresa's during his initial stint here as the Parochial Vicar and associate pastor several years ago. Upon his appointment as St. Theresa's pastor a year or so ago, he has again embraced the Knights via our local council, as well as being a stable presence in our parish family. 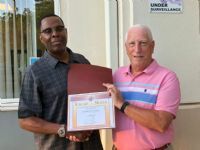 He has worked through the ins and outs of a very complicated building process and navigated the construction of our new youth building, which has been named C.I.T.Y. (stands for Christ in the Youth). We are proud to have him as our pastor, as well as a Brother Knight. Congratulations Fr. Joe! 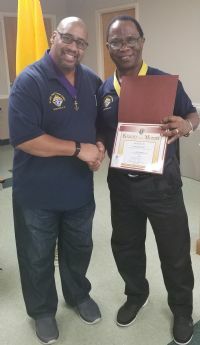 Our November Knight of the Month is Brother Innocent Oji. Brother Innocent is a devout catholic family man, who supports many of both the Knights and parish functions. He is also our current Advocate. Congratulations Brother Innocent! Congratulations to our October Knight of the Month, Brother Anthony Thomason. 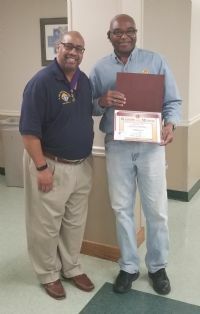 Anthony recently accepted the position of Director out Youth Ministry this past Jujy, after the Director at the time, Rene Singleton accepted the DRE position in her hometown f Savannah, GA. Bro Anthony has filled in magnificently. He and his lovely wife Sarah also welcomed a beautiful baby girl into their family. Evelyn Rose Thomason arrived on October 26th. Congrats Bro Anthony to you and your family!! Brother Amado has been a mainstay in our parish and Knight community. 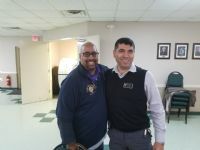 He is a frequent participant and organizer in events/celebrations such as the Our Lady of Guadalupe and The Passion Play conducted for the past several years on Good Friday. He is also a 4th Degree Sir Knight and regularly participates in the Honor Guard for many of our functions. Amado is a true testament to God's work in our community, as he continuously tries to encourage worship and fellowship with all nationalities that make up our very diverse parish. Thank you Brother Amado! 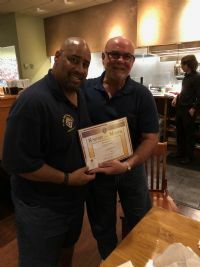 Congratulations to our August Knight of the Month, Bro Paul Lipari. 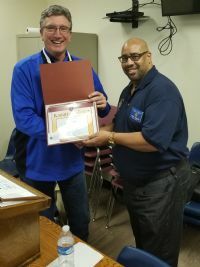 A long time member of our council, Paul has participated in and/or coordinated many events and projects: our Annual Golf Tournament, Operation Christmas and the Carrabbas Fundraiser, just to name a few. He has also served as a Trustee and an Outside Guard in the Council, as well as an Extraordinary Minister at St. Theresa. He has served and supported St. Theresa and the Knights for many years and truly deserves this award. Thank you Bro Paul! and participates in the Prison Ministry, the list goes on. St. Theresa is blessed to have such a faithful servant. Thank you for your witness to the faith Bro Warren! 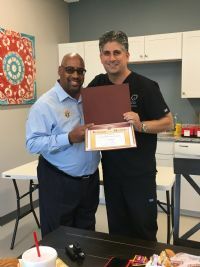 Congratulations our June Knight of the Month, Dr. Dimitri Arfanakis. He was actually chosen as last month's recipient, but headed off on a well-deserved vacation before we had a chance to award it to him. Nonetheless, he is well-deserving of the notoriety. In addition to being a respected dentist (he was recently inducted as a Fellow of the Academy of General Dentistry in New Orleans), he is a regular supporter of our parish, our community and the Knights (Douglas Dental Care annually supports our golf tournament which raises money for beneficiaries such as the OLPH Cancer Home and the Fisher House. Thank you Dr Dimitri for generously offering your time, talent and treasure! 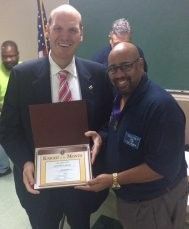 Congratulations to our May Knight of the Month, Bro Charles Wheeler. 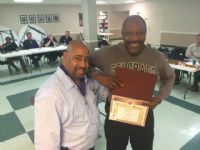 Charles is our current Recorder and in addition to co-chairing our Tootsie Roll Campaign, he regularly volunteers for many of our programs/events, including participation in our Assembly's Honor Guard. He is also an Extraordinary Minister of Holy Communion and PSR instructor. Bravo Bro Charles! 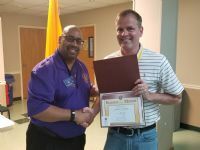 Congratulations to our April Knight of the Month, Dan Kochan. Among his many activities at St. Theresa's, Dan leads the choir at the 5 pm Saturday Mass and most recently, coordinated the effort to get a wheelchair ramp built for a member of the Douglasville community who was involved in a horrific car accident. Bravo Dan, thank you for all you do! Congratulations to our March Knight of the Month, Brother David Hagenow. 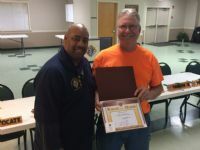 Brother David routinely assists with events/functions/ongoing projects such as the Annual Fish Fry, church ground maintenance, visitation to our Vets,... He is also a member of our Golf Tournament Committee and is a lector, usher and an extraordinary minister at Mass. Thank you David for your support of our council, our parish and community. 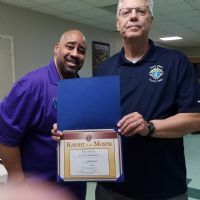 Congratulations to our February Knight of the month Bro Jerry Zlotucha, who among other things, coordinates our Quarterly Blood Drive as well as our Semi Annual Baby Bottle Drive and The Walk for Life to support the Pregnancy Resource Center. He is also a Lector and an Extraordinary Minister. Thank you for your service Jerry!! 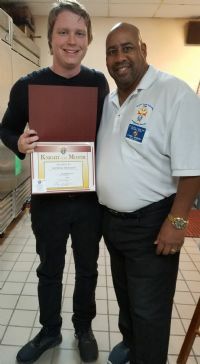 Congratulations to our January Knight of the Month, Hector Melara, who is very active in the St. Theresa Community as well as a continued supporter/contributor of our various Knight events. Congratulations to our December Knight of the Month. He is a member of our Degree Team as well as a regular volunteer with several of our events/fundraisers. Thank you Carl! Brother Eric Lewis, our November Knight of the Month. Bro Joseph Hrovat, October Knight of the Month. Thank you for all that you do, including your service as an Extraordinary Minister of Holy Communion, a Religious Education Instructor, participant/host for an ARISE Prayer Group and a member of our Formation of Men studying to become a Permanent Deacon.